I just started using the Arduino yesterday and cranked out code (based on BS2 code I wrote) to an UNO in no time. I cut my teet on the Zilog Z80 assembly and Sinclair ZX81 BASIC in the early 80’s. It was a challenge to write programs for the ZX81 with only 1K (that’s 1024 bytes) of RAM! But I love both of these platforms (Parallax and Ardunio). I was sold on the Parallax PSTAMP when I was asked to help a college senior with his project. He showed me the Board of Education ($100) that comes with a BS2 – and I was hooked. I prefer to write code in C/C++ and the Arduino IDE does that. I think that people wth little prograaming experiance should start out with the Parallax devices; then move to Arduino when they get accustomed to programming. I think schools should teach using the BS2 because (like the ZX81) there is little program space and even less RAM, so you learn to write very efficent (space wise) code. Right now Parallax BS2px is my goto device, but it is about $72 just for the Stamp device. The UNO is just as powerful, has much more RAM and program space, but less IO. But for $24 I was up and running on Ardunio. What can I say about Parallax? “When you get to Prom don’t forget to dance with the one that brought you” … I dance with all the ladies. Looking at just how advanced some of the newer boards (an accelerometer, magnetometer AND other sensors for £12) are now it occurs to me that the company who invented the WS2812/3 should make a miniature version which has RGBY and stacked die so it fits inside a standard form 4 pin LED SOIC casing. This would surely send regular LEDs the way of the dinosaur and enable a whole new level of hacking. 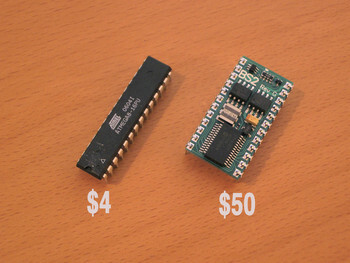 Another option I considered is adding a cheap SDR chip to Arduino, along with an onboard radio antenna. My own research suggests that this is possible for 50-1800 kHz which would take in the whole LW,MW and low SW band with other bands provided via heterodyning and blue LED tuning diode(s). If anyone is interested in funding let me know, the modification is very simple indeed and works remarkably well considering it uses existing materials available for negligible cost. I like big hair bands on the 80s just like everyone else, but that’s history. Parallax is also ancient history. Compare them on ANY level to a modern ARM core CPU and they look like primitive instruments you see in the museum. Come on people. I will be eternally grateful to parallax for the development of bs1. still believe in BS1 as the first option for children who are starting school. Wed after the child understand the basics of programming, it’s time to migrate to the Arduino. I too like the basic stamp, and have tried both. Its just easier to go to a higher level language to get what you need done. I have a friend who takes the compiled Basic, and can copy it into the PIC ic. Arduino is nice, but I find the basic stamp easier to use. The standard Arduino library supports the two main interrupts INT0 and INT1. Through standard libraries you have access to PinChange interrupts that works on 20 of the I/O pins. And if you know the AVR chip, you can easily access all the hardware interrupts directly (like interrupts for timers, SPI, I2C, A/D, etc.). But you usually don’t need to go that low-level. The Basic Stamp doesn’t support interrupts. How about the Arduino? I have been using the Basic Stamp for years for circuit board testers, cable testers etc. The reason I read this site was to see if switching to Arduino would be a better product for future projects. In software comparison above it was apparent that the Pbasic was much easier to code than in C.
The Stamp module described (or used) in the example is not one that I would recommend because it is very limited in speed and program complexity that it is capable of. I would recommend the BS2e or above. The BS2e runs at the same speed as the BS2 but can hold up to 16K of code (spread over 8 program slots). The BS2 and the BS2e run 4000 instructions per second, which is more than fast enough for most house hold projects. For projects that have a need for speed you can go to the BS2P which runs at 12000 instructions per second with up to 16K of code (over 8 slots). The devices that I build (some times) are pretty complex because I have my devices make decisions based on data collected. The cost is high for the modules, but their flexibility and power input / output is good (30mA). I would prefer not to have to spread my programs over several slots but it is easy to do. turn on and off other devices it is far easier to program in Pbasic. The example above does help to prove the point. Pbasic has functions that send data to LCDs or other devices in a single statement. To declare varibles is very easy ( X var byte, or X var word etc) no problem with brackets or braces. of re-learning C. I have only burnt 3 modules in the last 9 years of using them and one was replaced by Parallax (I didn’t know about their great warranty plan on the first 2). 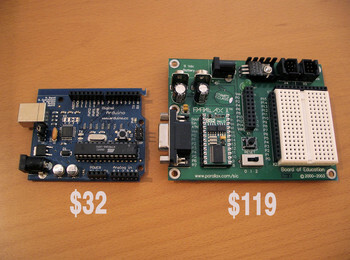 If Parallax were to cut the price by 60% for their modules there wouldn’t be any need for Arduino. As far as the Windows issue goes I don’t understand that, the programmer works smoothly in Windows, it finds the USB port automatically, the programmer can talk back and forth to the boards, no problem, no issue. Once a module is programmed it doesn’t need a connection to the PC, you can send updates to your customers / friends without them being able to see the code, they just plug the PC into the board and down load. Digikey is cheaper and easier. in many projects, it is very robust and capable and re-usable. Time to let the Basicstamp discussion rest in peace. We can choose for Microchip or Atmel on the same terms now. Pinguino platform is similar to Arduino but uses the Microchip processors. These processors have a built in USB support to make it even easier to use them. I designed a board for the Pinguino software named PING2550. It is an open hardware project. I doesn’t throw 30$ into one arduino project! One selfbuild arduino compatible platform only cost you abut 5$. Just to throw something else into the mix: around 1998, I got into BASIC stamps, because I didn’t want to learn assembler for simple robotics projects. There was obviously no Arduino then. However, at $50 each, I couldn’t put a Stamp into every project I built… so I started thinking about PICs. At that time, compiler options were pretty limited: MicroEngineringLabs’ PicBasic, professional C/C++ compilers, and not much else. However, around 2003, I discovered the free JAL compiler (which is still actively being improved and upgraded). The JAL syntax is reminiscent of Pascal, but it’s really its own language. It is very easy to learn and quite well supported (for freeware). Add one of the PIC prototyping PCBs available in any size and complexity from many different vendors, and you have a powerful setup. Even without that, the Arduino Learning page, the Arduino Reference page, and the many other available tutorials available directly on the Arduino website refute your point a bit. As for Propeller, it’s a great chip and can do amazing things. However, because of developments in the last few years, if your main need is video output or more power, I would recommend a Raspberry Pi ($35) or BeagleBone Black ($45), both of which are about the same price as a Propeller dev board with VGA port. And since both of these run a full version of Linux, you get the power of being able to interact meaningfully on the Internet via Ethernet or WiFi. Or connecting USB webcams or thumbdrives. One thing your comparison doesn’t take into account is support. I have seen many people start with Arduino and migrate simply because they can’t get any help or support when there’s an issue. Code help is scattered across many websites with varying responses from that particular user base. On the BASIC Stamp there are thousands or code examples for many things. To many the cost is worth the hair saved when there’s an issue. Some also prefer BASIC to a C variant that they may have to learn. And if learning a new language or starting from scratch most people will just go to the Propeller chip, which far outperforms the Arduino in every way and has eight cores and can also be programmed in C. Without additional hardware the Propeller can generate NTSC and VGA video, each core has 2 counter-timers and there are hundreds of objects available for a large number of ICs and sensors. But on your original title, I don’t think the Arduino will or has affected the BASIC Stamp in any way.